Reading a history book just isn't enough sometimes - seeing history re-enacted right in front of you is the best way to learn! This guide to re-enactments in PA will offer you a variety of historical re-enactments that will leave you feeling as though you're there! 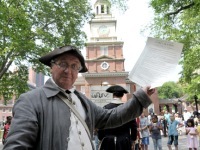 If you're looking to have a fun-filled day complete with history and reenactments, then Historic Philadelphia's Once Upon a Nation is the place to go! You will bump into all of your favorite historical characters, you will be able to stop in at the Betsy Ross House, and you will be able to experience history first-hand! Offering a wide variety of activities and events for history lovers of all ages, Historic Philadelphia is sure to enlighten you on the history of the great city of Philadelphia. You can plan an informative tour, or just walk around on your own - no matter what, you'll have a blast! 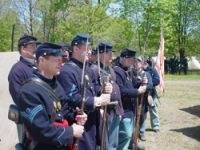 Come See Them Honor, Educate & Recreate History! Run like an army regiment of 1861, the 71st PA Volunteer Infantry Reenactment strives to authenticate their Civil War military impression. From 12 - 15,000 participants, this top-notch Philadelphia re-enactment group consists of a group of dedicated history-loving people who wish to share their love of history with others. Not only do they do reenactments, they do living history presentations, living histories, community events and lectures, classroom lecture, parades, historical society lectures, and more. With numerous events scheduled throughout the year, be sure not to miss their exciting and inspiring historic shows!